Birth Charts, Personal Profiles, Forecasts, Relationship Readings Tarot Readings. Available in Spanish. Build your email marketing list. Combines technology with the work of accomplished horoscope/ astrology Authors our custom design systems provide Daily, Weekly, Monthly XML / RSS Horoscopes automatically updated each day. Instant delivery on screen and via email of personal birth charts, short sample reports, full length interpretations plus free promotional readings in a choice of languages to increase your website revenues. Easy to use instructions for developers for implementation of any horoscope or astrology content with the minimum of delay. If you have your own original astrology text in any language we can use your own text or book to create a unique astrology web service solution. We provide content and systems for mobile phone applications. From SMS daily text horoscopes to full personal astrology chart and report display. Every day millions of people read Horoscopes via the web or email, their mobile phones or newspaper and magazines. Increasingly more via iPhone, iPad, iPod and mobile applications. Written by leading astrologers, XML / RSS / HTML rendered pages / WAP / SMS feeds deliver daily, weekly, monthly horoscopes about Love, Money, Career, Business, Health, Fashion as well as general horoscopes, automatically updated to your website, email subscription service or mobile application. We can provide XML horoscopes in any language. Check out sample horoscopes. We provide a trial XML via RSS feed to add daily, weekly or monthly horoscopes for web sites or Daily and Weekly SMS horoscopes plus licensing details for the horoscope feeds as well interactive astrology content. Branded Astrology Store . 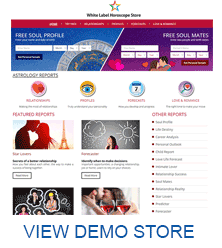 . . a unique white label application containing readymade USA and UK English language astrology and horoscope content to be viewed onscreen by users and delivered by email. Astrology reports and Daily Horoscopes for e-commerce, media and publishers. Free promotional birth chart analysis, personal reports are just some of the unique features of our customizable astrology stores. Creative interpretations with innovative delivery systems provide instant horoscope and astrology content as well as emailed daily horoscopes and personal daily forecast subscriptions with your company or web site branding. Custom Form Integration . . . Individual Astrology reports with HTML, dhtml, or iframes purchase forms customized to integrate seamlessly with merchant banking and your web site design. Contact us, with your requirements and we can supply you with horoscope pricing and a trial feed.